Aside from company and product news, 178 Short Cuts also remembers Andrew Higgins, Raye Montague and Charles Everhart, three meritorious individuals of the boatbuilding and design trade who sailed for Fiddler’s Green or were recognized for their contributions to the industry. ≡ Andrew Higgins, 1886–1952, a New Orleans boatbuilder who developed and built the LCVP (Landing Craft, Vehicle, Personnel) that was instrumental in the Allied invasion of Normandy during World War II, will be inducted posthumously into the National Inventors Hall of Fame this May in Washington, D.C.
≡ German electric outboard/inboard manufacturer Torqeedo continues to enlarge its global footprint with installations in larger craft. 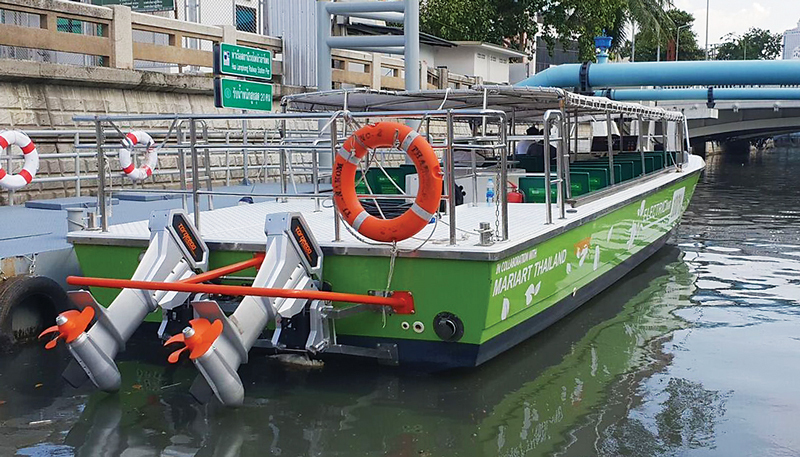 Latest is a 47‘6“ (14.5m) 40-passenger ferry in Bangkok, Thailand. Replacing the ferry’s old 205-hp (154-kW) diesel are two 10-kW Torqeedo Cruise outboards powered by six lithium batteries and fast chargers. www.torqeedo.com. ≡ Advanced Wing Systems, the Australian developer of so-called soft-wing sails, has partnered with the New York Yacht Club’s America’s Cup challenge American Magic. AWS’s Greg Johnston says he has helped incorporate its technology in the 38‘ (11.6m) test boat, the Mule. Johnston says it “delivers many of the performance benefits of the rigid-wing sails used in previous America’s Cup matches, but with fewer operational and logistical difficulties.” www.advancedwingsystems.com. ≡ Searching for a new boat? Even if you aren’t, many of your customers are. The online marketplace Boat Trader recently announced the launching of a new app for iOS and Android mobile devices, which it says offers faster searches for new and used boats. Among the improvements are state-of-the-art location technology and the ability to save searches. ≡ Charles Everhart, the first person hired by Hatteras Yacht Co., died last December at the age of 90. Among his several positions was serving as plant manager of the High Point, North Carolina, facility until 1976. He retired in 1985.